In November of 1874, two cousins, Uriah Stoop and Elias Fuselot, both severely affected by something they called ‘the ossifyin’ rheumatiz’, set off by wagon train on a journey to find a new home and create a better life. They were accompanied by their wives and children and were later joined by two other couples, (Andrew Tripzen and his wife and the Trask brothers, Zebulon and Isaac), as they sought to create a new community of similarly afflicted people. The two cousins dreamed of a town where people with diseases such as theirs could all live in peace and harmony, with a common understanding of pain, and a promise to help one another deal with the extreme hardships of Life brought on by their common disease. Elias and Uriah longed to create a kind of "Utopia" where they didn't have to deal with the taunts and disparaging remarks of healthier individuals, and where everything was tailored to accommodate their special needs. Mssrs. 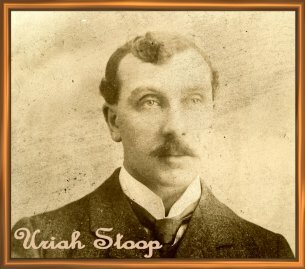 Stoop and Fuselot were a determined and dynamic twosome, sharing a level of suffering that we can only imagine, while somehow retaining a steely resolve to fulfill their dream of a new type of community; the town which would eventually become Spondyville. They wandered for many months, searching through many states and territories, peacefully interacting with both the early American immigrant settlers and Native Americans alike. Many Native Americans, in fact, recognized and empathized with their suffering. Some Native Americans even considered Stoop and Fuselot to be living embodiments of “Kokopelli”, a Native American fertility diety, often depicted as having a rounded or bent-over posture, much like that of our beloved Founders. Probably because of this, they were always treated with great respect and honor as they traveled through the 'unsettled wilderness'. And naturally, they gave equal measure of respect right back to all with whom they interacted. 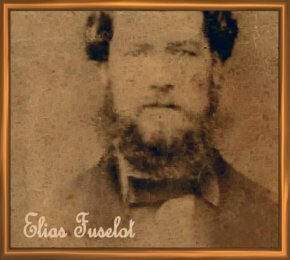 Elias Fuselot once explained that what they endured in their lives made them much more sympathetic to the suffering of others, no matter what they looked or sounded like. Note: The Native Americans also shared with Mssrs. Stoop and Fuselot their use of Willow Bark to treat pain and inflammation. The fact that Willow trees are found in such great abundance in the area surrounding Spondyville is no accident. Though the months dragged on, and their supplies dwindled, they kept searching for their ‘Utopia’. Truth to tell, their travels would have been tough on even the most able-bodied of men, much less two individuals who were very limited in their movements and were in constant pain. On March 4th of 1875, The creaky wagon train entered a lush valley with fertile fields as far as their iritis-plagued eyes could see. The fields were bordered by a beautiful and gently flowing river to the East and gorgeous green mountains to the North and West. From their first glimpse of the countryside, both men knew that they had found the location on which they could begin to build their "paradise". They set up camp and immediately dubbed the new settlement, "Rheumadelphia", even jokingly referring to it as the "Future City of Cousinly Arthritis." 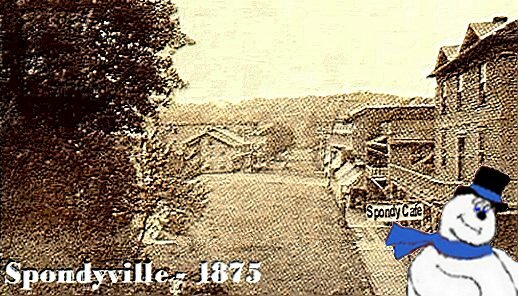 And so, the town, which eventually would become better known as Spondyville was born. 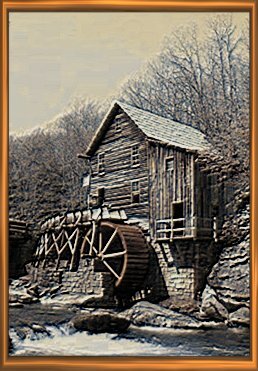 After setting up living quarters for himself and his family, Elias Fuselot, who had been a Grist Mill worker in his youth, immediately began making plans for building a mill on the river. His wife, Flossie (nee Fluegel), a sturdy young woman of Dutch and German extraction, (along with their 12 children), helped with the construction and running of the mill, (pictured below), which operated on the Sacroiliac River until 1961, when it was turned into a museum. Spondyville: The Next Generation. 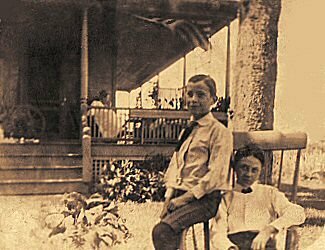 Elias Fuselot Jr. and Uriah Stoop Jr. enjoy a Fourth of July holiday together circa 1910. More Spondyville History as it occurs to me ... Stay tuned.